You have an opportunity to learn a basic overview of how projects in the City get a stamp of approval. Back by popular demand is the Department’s Planning 101 training! 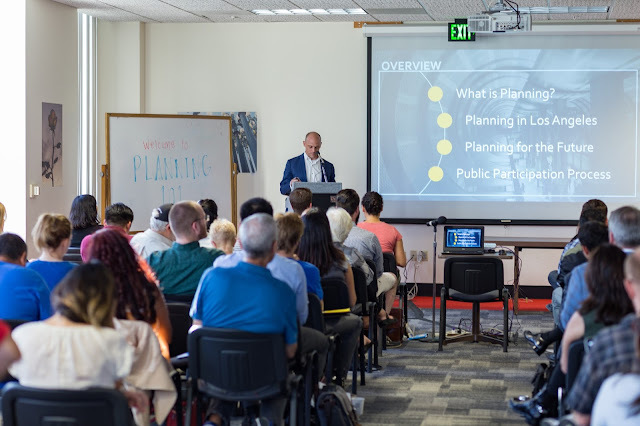 This time, we will be back in your community talking about the basic elements of the City’s development process and key points for public participation. We will also introduce you to our Project Planning Bureau – the team who receives, processes, reviews, and issues recommendations for various types of cases. From the Harbor to the Northeast San Fernando Valley, we were so thrilled to be able to meet and talk to nearly 400 fellow Angelenos who were both familiar with and new to planning. We're excited to be teaming up once again with the Department of Neighborhood Empowerment on this effort. Please join us at any of the seven Project Planning 101's. this spring!